This January, for the 5th year in a row and the 6th time overall, I attended linux.conf.au. This year I did not submit a main conference talk as I was busy finishing my final year project as the call for papers went out. I did submit and have accepted two miniconf talks; one about my final year project for the Research and Student Innovation Miniconf, and another with Mark Jessop delivered at the Ardunio Miniconf. For the past two conferences Jon Oxer, a microcontroller enthusiast from Melbroune, has run the Arduino Miniconf. It grew out of past tutorials where Jon has provided Arduino boards for the audience to purchase and walked through how to program them. It also replaced the Embedded Miniconf which was last run in Melbourne 2008. The morning is set aside for hardware hacking, which for this group involves soldering together various through-hole PCBs containing various sensors attached to an Atmel ATmega microcontroller. Add the Arduino bootloader and you have something that is commonly referred to as an Arduino – a term that indicates a certain ease of use for those who don’t want to get down and dirty with the specifics of a microcontroller’s programming interface and data types. As Jon says in his call for papers, “the Arduino Miniconf gives hard-core software devs who typically attend linux.conf.au an opportunity to experience the joy of hardware hacking”. Our talk was titled Project Horus: High Altitude Arduino, and it introduced attendees to Project Horus and high altitude ballooning in general. We focused on the hardware and software that is used, and explained how a balloon is tracked following a launch. That lead nicely into some story telling where Mark and I told the tale of Horus 8, where Mark’s final year project flew as a payload and landed in the ocean, to be rescued by myself in a canoe and our project founder, Terry. The two boards being assembled was the KitTen starter kit, and the MobSenDat, a flight computer designed by Luke Weston for recording telemetry in the model rockets that many attendees were building the following day. The software we flew was derived from the balloon telemetry code written by Terry and the sensor test code by Luke. We named it MobSenDatHab, and it can be found here. 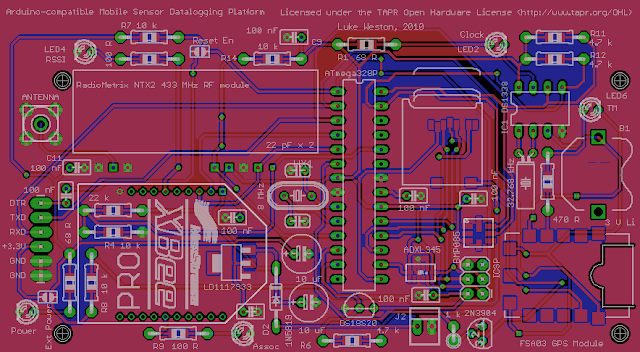 The 8MHz ATmega328P can store this information to SD card, or transmit it over either a XBee (yuck!) 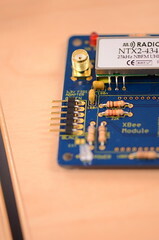 or a Radiometrix module; we used the 434MHz NTX2 on one board and the 151MHz TX1h. As we explained in the talk, the modules are used as a voltage controlled oscillator to transmit 300baud frequency shift keyed (FSK) RTTY data to a ground station. The ground station consists of a upper side band (USB) receiver which mixes it down to audio frequencies, and a laptop which takes this audio signal and feeds it into fldigi, an opensource program for decoding various text-based modulation schemes used by amateur radio operators. The week before the conference we had launched Horus 14; a multi-payload flight where we tested the first of the MobSenDat fight computers. The board performed very well, and was able to be received at times that the normal Nut payload was not. This could be explained by the higher transmit power – 10dBm vs 20dBm – however a small contribution could also be from the lower frequency used, as path loss is proportional to frequency. The other payload we flew was a special one. It contained the HD camera playload that had been flown before, but instead of simply filming the scenery, a small plush Tux – the Linux kernel’s mascot – was placed in the field of view. Tux flew to 30 276m, covering 180km and flying for 2h 19m. We recorded 1080p footage all the way up and all the way down, but kept it secret until premiereing it at the miniconf. It was enjoyed by all, and kept under wraps for a further two days until we showed it to the entire delegation of conference atendees. Unfortunatly a technical error meant only half the video was seen, but everyone enjoyed it none the less. Since then it has been made public, and has recieved 2 607 views to date. In addition to showing people a cool video, the purpose of the flight was to create a unique item to auction off at the conference dinner. In the past money has been raised for Tasmaian Devil face cancer research, and New Zealand emergency services. This year the money raised was donated to the Queensland Premier’s Disaster Relief Appeal, to help out those who have suffered due to the extreme flooding in Queensland this summer. 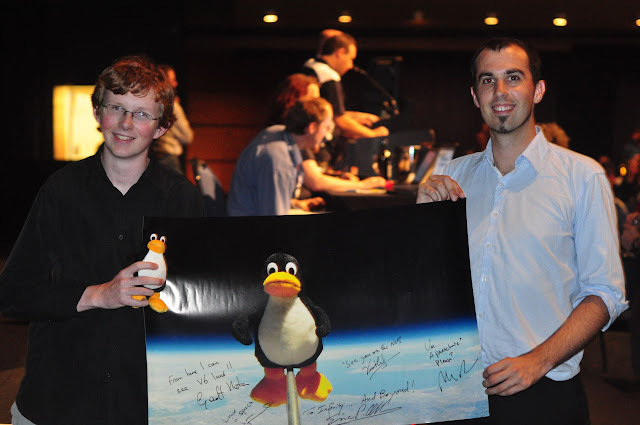 The conference managed to raise $23,239, by auctioning off both the plush Tux and a large print of Tux at apogee signed by conference keynote speakers Mark Pesce, Eric Allman, Geof Huston and Vint Cerf, as well as Linus Torvalds. David’s in depth Horus 14 write up Tux in (near) Space.